Text often tends to expand upon translation. Not a lot of people know that, but it’s true. For example, if you submit an English (source) document consisting of 1,000 words for translation into Spanish, the translated (target) document will usually contain approximately 20% more words. Now, it’s not that we deliberately pad the document out with ‘fluff’ so you feel you are getting more for your money, that’s just the way languages work. Some are more verbose than others so the number of words in the target document is inflated compared to those in the source document. You see, some language translation companies charge you by the number of words in the completed translated document – we call this the ‘target’ document. This is a problem as at the time you place the order, you won’t know how many words will be in the translated document until it’s finished. There could be many more than you think meaning you’ll be charged more than you are expecting. Of course, sometimes it works the other way around. The translated text has fewer words than the original. Whilst that can be nice, it still comes as a surprise makes it hard to budget. We prefer to quote on what is in what we can both see – the document in hand. We always quote based on the number of words in the source document you provide us with. That way, we can count the words before it’s translated and give you an accurate quote meaning there’ll be no nasty surprises when the bill comes. We think it’s better this way and, to be honest, we’re a little bit suspicious of those who do not. Why would you want to give your supplier an incentive to produce ‘sloppy’, overly long winded text just so they can bill you more money? Doesn’t seem right to us. 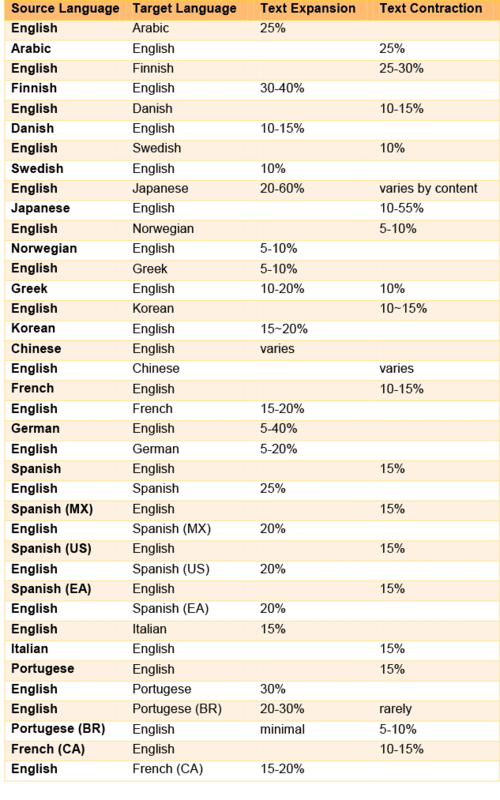 The table below shows the rough expansion or contraction expected when translating to and from various languages.